Corporate America continues to regain confidence as positive economic trends accumulate, resulting in the creation of private-sector jobs for the ninth consecutive month in April. All 10 private sectors added workers during the month, offering the clearest signal yet that increased consumer spending and expansion in goods-producing segments have spread to the broader employment market. While the unemployment rate rose during April, likely reflecting auto industry layoffs stemming from supply-chain interruptions in Japan, slack in the labor market will encourage additional hiring in the months ahead. Rising demand for goods and services enabled private-sector employers to add 268,000 jobs in April, marking the largest monthly increase in more than five years. Favorable currency valuations continue to stimulate strong foreign demand for U.S. goods, leading manufacturers to create 29,000 positions last month. 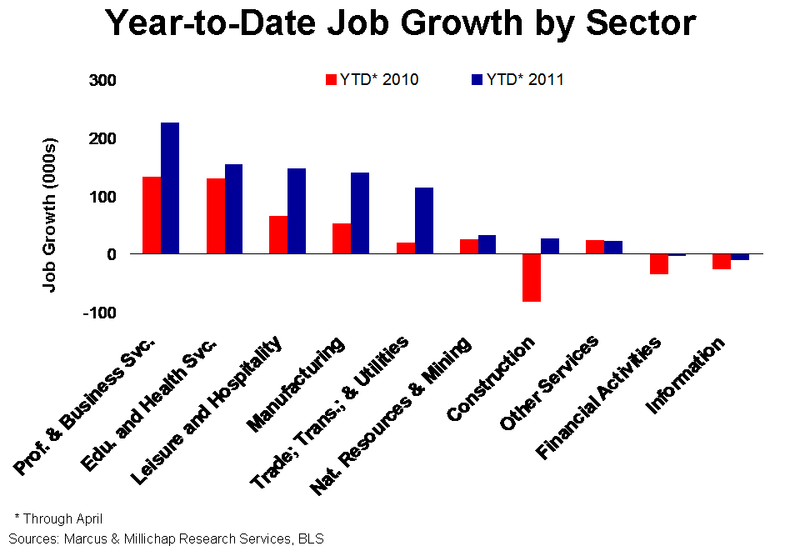 Year to date, mills and factories have added 141,000 workers, up from 53,000 jobs in the same period in 2010. Employment growth continues to brighten consumers’ outlook and increase retail spending, supporting the hiring of 57,000 retail positions last month and nearly 85,000 jobs year to date. Leisure and hospitality also benefited from the resurgent consumer, adding 46,000 new employees in April. Office-using employers have entered a transition period, lessening their reliance on temporary workers and committing to expanding full-time staffs. Fueled by gains in professional and business services employment and modest increases in financial services and information staffing, full-time office employment rose by 59,000 workers last month. Year to date, 172,000 full-time office positions have been created, compared with a loss of 57,000 posts in the same period last year, when employers relied extensively on temporary workers to handle workload surges. The increase in full-time office-using employment has positively affected the national office sector. After remaining unchanged for two quarters, office vacancy ticked down 10 basis points in the opening period of 2011 to 17.5 percent on 7.1 million square feet of net absorption. Continuing payroll expansions will accelerate the backfilling of under-utilized space through the remainder of the year and generate new space requirements as employers prepare for faster economic growth in 2012. As a result, U.S. office vacancy will fall 60 basis points during 2011 to 17 percent. Growth in retail spending and the addition of retail jobs this year have not generated an appreciable increase in retail space demand, as vacancy was flat in the first quarter at 10 percent. Large, national retailers continue to re-staff well-performing stores but are still hesitant to expand, while the formation of small, local retail businesses remains hampered by a lack of credit. Additional gains to total employment and improvements in other economic gauges over the coming quarters will start to override caution, though, leading to a 50 basis point drop in the retail vacancy rate this year to 9.5 percent. The ongoing recovery in travel and hotel room demand supported the creation of 3,800 hotel jobs last month and 24,000 positions year to date. Estimated occupancy in April was 61.2 percent, up from less than 59 percent in 2010, with strong gains in business-reliant midweek periods. In addition, the average daily rate rose an estimated 2.5 percent last month, although lower business rates negotiated last year continue to limit the amount owners can increase rates. This entry was written by marcusmillichap, posted on May 10, 2011 at 5:28 pm, filed under Research and tagged Employment. Bookmark the permalink. Follow any comments here with the RSS feed for this post. Trackbacks are closed, but you can post a comment.